NIXUS2PROTECT producer of fast deploy shelters and equipment. Transport size, deploying time and reliability are the main objectives of NIXUS. 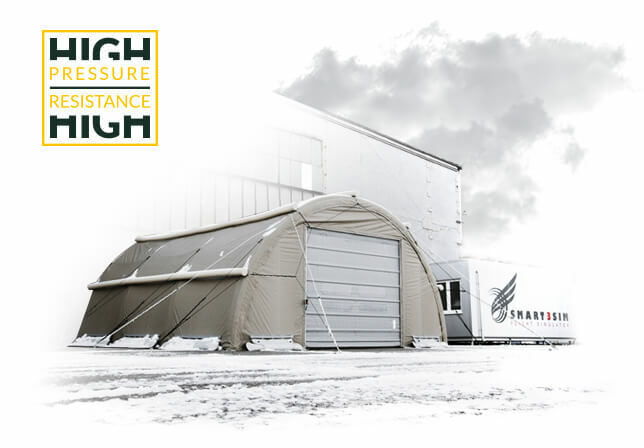 Choose from a variety of pneumatic or solid shelters for temporal or semi-permanent accommodation, field hospitals, emergency medical or industrial purposes. Our team works closely with clients, ready to apply own patented solutions or to design new custom made products to fit to special field purposes. All NIXUS products are engineered and produced in the EU, by ZEPELIN, Ltd. COMBAT ENGINEER Conference in Krakow, Poland. NEW high pressure tent using ANGLED TUBES. Heavy duty pneumatic shelters for all weather conditions, fulfilling all the material, safety and transportation norms. High pressure inflatable tubes guarantee no risk of structure collapse by temperature fluctuation, wind or snow. All NIXUS products are modular, offering variety of concepts as base camp, mobile hospital, canteene or warehouse. 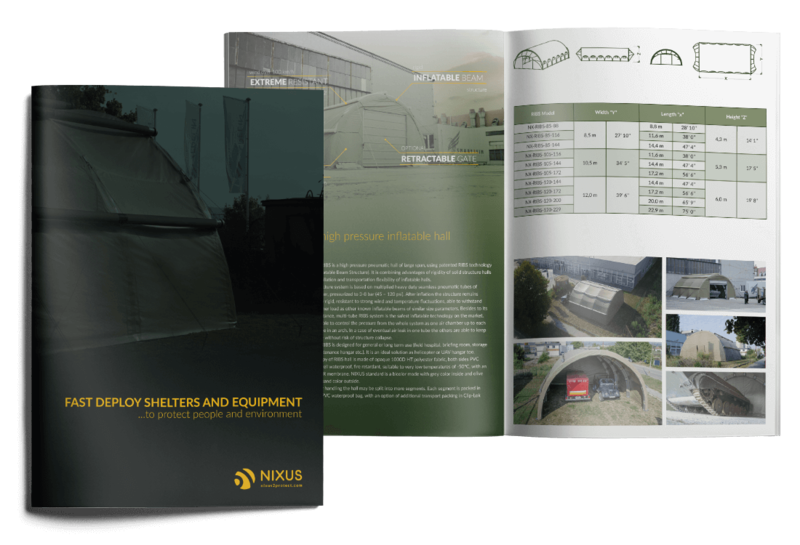 Choose out of different NIXUS models to fulfill your special requirements – prefering light inflatable structures for emergency use, middle-weight structures for temporal use or heavy duty structures for semi-permanent personell or refugee accommodation. All packed for easy transportation including necessary accessories, because each minute counts. Fast deploy protection shelters for on site construction work. A variety of collapsible containers for water, fuel or fertilizers, foldable liquid waste collectors and many more products for industrial use. 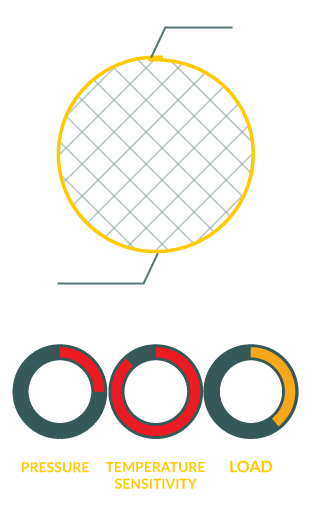 All made of high tech coated fabrics and materials conforming EU norms. Contact us for more information. Even most of NIXUS tents are INFLATABLE, all of them are using different technology of inflatable beams. To understand this topic better, below is a description of how each system is working. A special place is given to RIBS system, our patented invention. 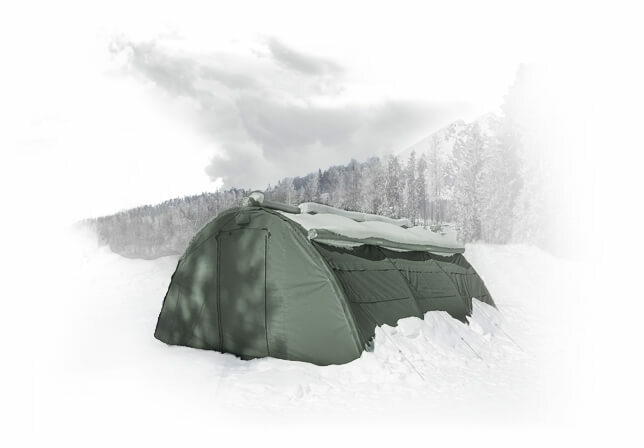 LOW PRESSURE shelter is typically made of high frequency welded fabric, where flat sheets of material are joined into tubular shape. Such seam, as well as material, has certain load resistance, given by its characteristics. To prevent a material or seam rupture, there is installed a pressure release valve, which helps to release an overpressure during hot days. For same reason there use to be installed a pressure control system, automatically compensing the air loss and adding extra air during cold night. It is a well proven system made by most of producers and used in many countries, but its weak point is a sensitivity of the system itself..
Pressure control equipment is typically not necessary with HIGH PRESSURE structure. Its seamless, heavy duty tubes are able to withstand an extreme internal pressure, which provides enough load of inflatable beams in any temperature conditions. High pressure structure is a stable system, independent to temperature fluctuations, able to stand for weeks without any maintenance.. 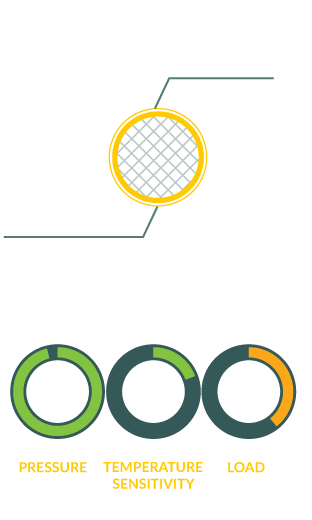 RIBS system is offering all advantages of HIGH PRESSURE structure with additional advantage of high load, given by multiplication of high pressure tubes. For its good stability it is recommended as a construction element of big structures, which were problematic to be realized by using existing inflatable technologies. RIBS system brings new possibilities for field applications.. RIBS is fast to setup and easy to transport as INFLATABLE STRUCTURE but still extreme weather resistant as a RIGID STRUCTURE . 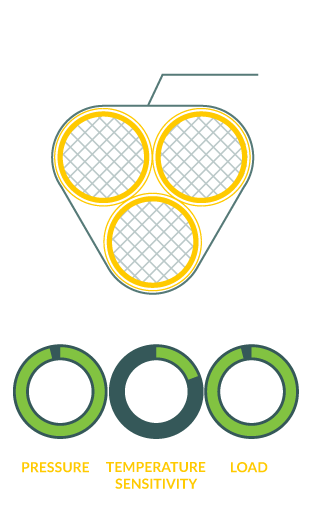 or dividing whole air system to single tubes, giving each beam a multiple security.